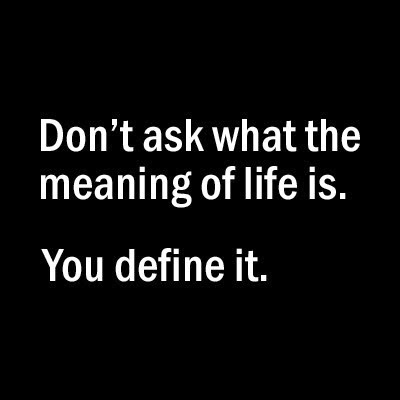 Don’t try to make meaning out of Life. Make your Life meaningful. Don’t dismiss Life as a game of Snakes and Ladders where you will always be getting the Snakes. Nor is it a game of Chess where you are a mere pawn. Life is such an inscrutable experience that it has a mind of its own, an agenda of its own and has a pace of its own. So, you will find it dealing you a hard blow when you least expect it or it will give you a bounty when you have completely lost all hope. When we label Life as “terrible, a pain, agonizing” in the first instance, or, when we call it, “benevolent, fortunate, gracious” in the second one, we are trying to make meaning out of it. Either meaning will disappoint. Life is like water in your palm. It is not going to be there forever, and definitely not in the same way that it once was. So, the only way to make Life meaningful is to do something that makes you happy each day. Choose happiness over worry or sorrow in each moment. In the toughest of situations, you will find a reason to smile. Choose that moment to cling on and claw your way back. Once you have learnt this method, you can then start making Life meaningful in more ways__by touching other lives. Be there for people. Offer your time, your shoulder and your helping hand. Know that only you can make your Life meaningful. Because it’s your Life. If you don’t find any meaning in your Life, to your Life, it’s only because you have not exercised the option to be happy or you have not reached out to touch another Life. Think about it. It will make a lot of sense! Life is in control. Always.